There was an attempted armed robbery on an Asian owned shop on Saturday afternoon just before 6pm, 10th March 2018. More than ten men armed with homemade guns and knives stormed the shop and proceeded to attack the shop owner. A member of the gang opened fire at the Chinese national wounding him. The gang were not aware that the Chinese National had a pistol. When he reached for his pistol, the gang made a getaway, but not after being shot at by the shop owner. One of the gang members was shot in the shoulder and back from a 9mm pistol. Member's of the public called the Police Toll Free number upon seeing that a robbery was taking place. Police Sector Patrol Units were immediately dispatched to the scene. The suspects when escaping got on a double cab Nissan which the owner has now claimed to have been stolen from him minutes before the robbery. Unfortunately for the robbers, the vehicle turned out to be defective and could not move after the failed robbery. The gang had to escape on foot. The wounded suspect was apprehended by Police. Another two suspects escaped on foot up towards the main road. Police SRU responding gave chase and apprehended the pair with the assistance from ESS Security. The Chinese shop owner is in stable condition and is receiving treatment from the gunshot wounds, mainly pellets. The wounded suspect is also receiving treatment. He will be charged along with the other two detained in Police custody. “We have identified these suspects to be from Miles area. The wounded suspect is from Yangoru ESP, whilst the other two are from Morobe. 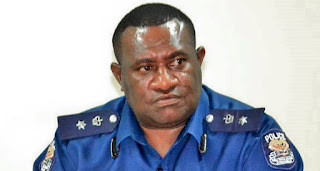 Lae CID is still investigating and we should make more arrests soon,” said Lae Metropolitan Superintendent Anthony Wagambie JNR said.